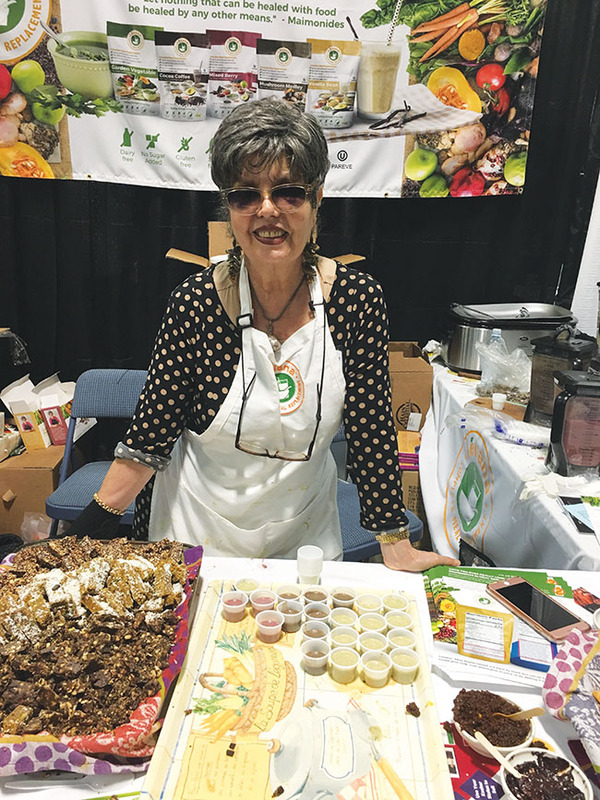 Kosher cookbook author and former restaurateurs Levana Kirschenbaum offering an alternative to meal replacement drinks — hers are kosher and without added sugar. Kosherfest is decidedly not a gourmet festival or fancy food show. No one is talking sous vide cooking, and there’s no pulled sugar to be found. Best-in-show this year was a frozen deep-dish pizza by Gino’s. “Here, the food is heimishe and the crowd is heimishe,” said Alyssa Kaplan of West Orange, a food blogger and owner of KosherGourmetMart.com. But for those not necessarily interested in upmarket kosher fare, and for those looking for business opportunities — finding a distributor, discovering new niche products — it was the best show in memory. Perhaps that’s because entry into Kosherfest was more restricted than in previous years, the requirement for attendees to be tied to employment in the food industry having been heavily enforced. “There are fewer people coming in off the street and less window shopping,” said Eli Franklin of Pelleh Poultry and Bethel Creamery in upstate New York. Goldman, the owner of Simply Sushi, with 11 sushi bars — eight in New York and three in New Jersey (Lakewood, Bergenfield, and Clifton) — said that for him, beyond meetings with exhibitors, truffles, imported by Sabatino Tartufi from Italy and France, made the biggest impact. They come whole, but also as Truffle Zest seasoning, infused in other products like olive oil and soy sauce. Sushi with Truffle Zest, anyone? The company’s Jade Rosenberg said Kosherfest is among her favorite shows. Why? There’s not much competition. “Everyone is always excited” to see them there, she said. Several new products launched at Kosherfest included packaged sausages from the Wandering Que, the much-beloved “Traveling Texas Kosher BBQ.” Until now, Que had only sold the sausages at street fairs where there would be unusually long lines, and from a food truck. El Paso, Tex., native Ari White is the master smoker behind the operation, now headquartered in Newark. Having fallen hard for New Jersey, he predicts it will be his home within the year. As if to prove his love, the bar code on his products is in the shape of the Garden State. But if you’re looking for spicy chorizo, you may have to wait. White is wary of scaring away his customers with too much too soon. He has, however, devised a spicy name for one of his packaged delicacies: The Soprano. And meet Fruit IQ from the original “fruit leather” company, JORAY. The new version of the rolls is certified non-GMO, vegan, and gluten-free. Raymond Shalhoub, fifth-generation sweets producer, said, “Now there’s such a demand for natural ingredients, no artificial color or flavor.” To keep up with the times he has “reinvented” the treat for a new generation; it is “more tart,” he said, and has “a different mouth feel” from the original fruit rolls. The one true novelty at the show, the item you’ve never seen before and won’t soon forget? Printed matzah — unleavened bread printed with colorful designs, including a stained-glass magen David, an illustrated seder plate, and a blue star-adorned kipah. For now, it’s preset designs only, but by Passover 2019, the company expects to be able to do smaller runs —just enough for your seder guests, for example — with custom images and text. 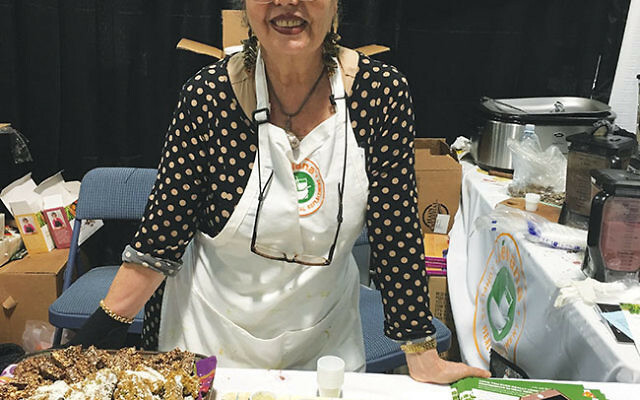 Gluten-free foods had a starring role at Kosherfest this year, from the “artisanal” oat challah (five flavors: classic, sesame, onion, poppy, and chocolate), to snack crackers and at least three kinds of gluten-free cookies. Of course, Kosherfest isn’t a health food festival, and there were plenty of heart-stopping, artery-clogging fried and preservative-heavy foods, including kibbeh and kugels, cured meats and cold cuts, battered fish, battered apples, and breaded mozzarella sticks. But my favorite booth this year offered neither food nor novelty nor Old World specialty. It was Happy Hearts Wine, based in Brooklyn. I didn’t even taste the wine (though I did sample the syrupy-sweet fig liqueur), but it was the two jovial men at the booth Yoav Gez of Lavie Wines in Efrat, and his American colleague who captured my heart. They offered joy, neat. Stripped of all the bells and whistles, that, it seems, is what kosher food ought to be about.